After only a quarter since Princess Sevillena, Kimberly Baluzo, Louie Anne Culala, Carmela Ariola and Ace Bartolome battled it out at the Wishcovery Grand Finals at the Smart-Araneta Coliseum, the five promising singers once again conquered the iconic dome as they staged their sold-out “Wishful Journey” concert on June 19, Tuesday. The concert was held in celebration of the release of their debut record as the Wishful 5. 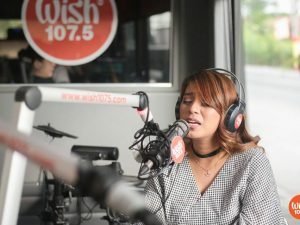 The album of the same name was launched as part of the partnership between BMPI, the content provider for Wish 107.5, and the ABS-CBN-owned record label, Star Music. 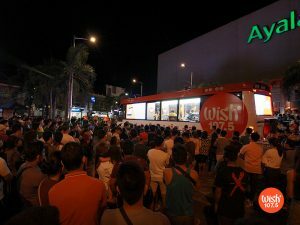 Earlier in March, the two companies joined forces to foster the music career of all the top five finalists of Wishcovery, the online singing competition of Wish 107.5. 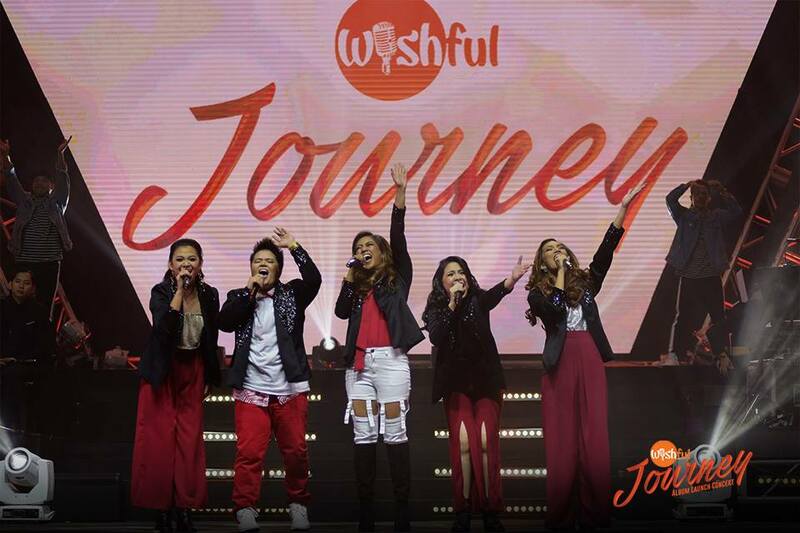 “Wishful Journey,” the album, was made available a day before the event via the ABS-CBN Store. After selling over 15,000 units in just one day, the record is now certified platinum by the Philippine Association of the Record Industry (PARI). The platinum record was awarded to the Wishful 5 during the concert, making it one of the most memorable highlights of the evening. The rising singers also received a gold record award for surpassing the 7,500 unit-mark. The effort has a total of 18 tracks which include two collaborative performances from the Wishful 5, six solo original songs, and eight revivals of classic OPM tunes. Apart from the said awarding, the Big Dome concert also featured stunning performances from the Wishful 5 and their guest OPM stars. Sevillena, Baluzo, Culala, Ariola and Bartolome kicked off the evening with a powerful song-and-dance rendition of the Jungee Marcelo-penned “Discovered.” The OPM piece first made its appearance during the group performance of the Wishful 5 during the Wishcovery Grand Finals. Before the Wishful 5 took the spotlight with their respective originals and revivals from their album, they also shared the stage with the country’s own world-class acts, Asia’s Phoenix Morissette and Pop Rock Royalty Yeng Constantino. The two special guests also had their own solo stints. Apart from the said OPM stars, other special guests also include R&B royalties Kris Lawrence and Daryl Ong, and Pilipinas Got Talent Season 6 grand winner Kristel De Catalina. The concert’s thrilling atmosphere escalated to another level with their emotional revival of “Patuloy Ang Pangarap.” The Wishful 5 consider this opening track of their debut record as the song that best describes their wishful journey — one that is filled with hope despite the many hurdles they encounter along the way. They capped off the night with their own take on the Wish 107.5 theme song. 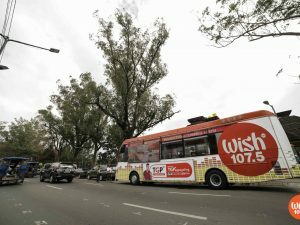 Sevillena, Baluzo, Culala, Ariola and Bartolome were discovered through Wish 107.5’s Wishcovery. The online show aired on the station’s YouTube channel from September 2017 until March 2018. Conceptualized by BMPI CEO and President, Kuya Daniel Razon, Wishcovery aims to scout Filipino singing gems who have the potential to be the next big music star. Apart from a two-year exclusive recording contract under Star Music, all five Wishcovery grand finalists received cash prizes and secured a five-year management deal with BMPI. Sevillena, who was declared as the competition’s grand champion, won a brand-new car, a house and a lot, and a round-trip ticket to New York, USA for an extensive musical training. Get your own copy of “Wishful Journey” for only Php 450.00 at the ABS-CBN Store located at G/F ELJ Communications Center, Mother Ignacia St., Diliman, Quezon City.